"The MEGA MAN: ROBOT MASTER FIELD GUIDE is your ultimate handbook to the classic Mega Man universe. Inside you'll find profiles of every major Mega Man character, including all the Robot Masters from Mega Man 1-10, Mega Man and Bass, the Mega Man Gameboy series, plus important special characters like Proto Man, Rush, Roll, Duo, and more. Each profile features classic CAPCOM artwork, and includes bios, quotes, likes & dislikes, weapons, and of course each Robot Master's secret weakness!" The book is being published by none other than Udon Entertainment and is said to release on March 2, 2011. Needless to say, this looks to be an exciting addition to any Mega Man fan's collection of books. Wonder if it will also include Cossack, Kalinka, Ra Thor, Ra Moon, Plum, Chest, Ripot, and enemies like Mets and Joes. Sounds interesting. Maybe this time around, characters like Dr. Cossack, Kalinka, and Dark Man will be included. For some reason, they were absent from Mega Man & Bass's database (even though Cossack was mentioned in Beat's data card). That's good and all, but will it include Bondman? 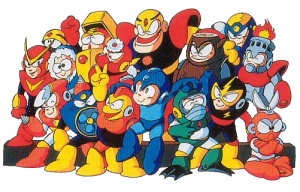 Well Mega Man and Bass had 100 CDs exactly, so they probably just felt to stick to the robots and Wily and Light. I'm curious whether or not Fake Man will get an entry in this. Sounds like fun. Pre-ordered and ready. Maybe if we're lucky we'll get a "Maverick Field Guide" some day? I know a few X fans who would love one of those. Is this the first time we're hearing about this book? Seems like it came out of left field, since it's not something that's being released in Japan that they're bringing over... or is it? Ooh, this sounds quite intriguing. I think I'll be getting this for myself, when it comes out.